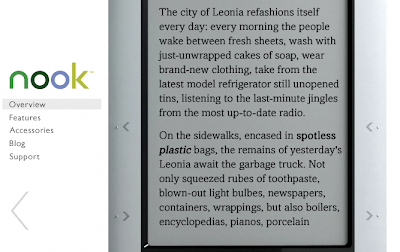 What are we to make of the text that Barnes & Noble has chosen to use in the sample pages of its new ebook reader, the Nook. (Nook? As in Rookery Nook? Nookie Bear?) It is a passage from Italo Calvino’s Invisible Cities, in particular the city of Leonia. Leonia is the ultimate in consumer wastefulness – every day all its consumer products, both ephemeral and durable, are thrown out, only to be themselves replaced 24 hours later. The detritus surrounds the city like a range of mountains. Are Barnes & Noble telling us something about the purchasing of books – that we need new ones every day, and should discard the old? Or the the Nook releases us from this fate, as we need not accumulate any physical books at all? Or has some subversive noted that each season will bring a newer, better ebook reader, so that the old ones can be discarded, indestructible, on to the growing waste-dumps of Leonia? By the way, William Weaver’s translation is correctly ‘light bulbs’, not ‘bulbes’; ‘tubes’, not ‘rubes’, of toothpaste. And I think the strange use of bold and bold italic is supposed to show how you can highlight passages of text. The text appears to be in a version of Monotype Amasis, but the italic is a sloped roman (we are told it can display five fonts). 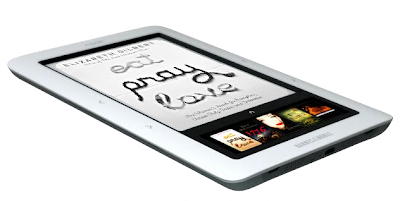 The Nook has the marketing advantage of being able to show covers from the Banes & Noble online store in colour because, as well as the epaper reading screen, there is a shallow conventional colour screen below.